Which Burns More Calories: Walking or Biking? In general, bicycling burns more calories than walking, but this depends on the difficulty of each activity as well as the person doing the activity. All calorie burning figures are estimates; your results will likely be slightly different. The American Council on Exercise's calorie calculator measures calories burned from several speeds of walking, from casual walking at 2 miles per hour to speed-walking at 5 miles per hour. Similarly, the calculator measures biking at casual, regular and racing or strenuous paces ranging from 5.5 to 19 mph. The faster you walk or bike, the more calories you burn. Biking burns more calories except when comparing slow biking to moderate to fast walking. If you weigh 175 pounds and bike 5.5 miles per hour, you'll burn approximately 318 calories in an hour. If you walk at 3.5 miles per hour for an hour, you'll burn about 302 calories, compared with 714 calories at 5 miles per hour. If you weigh more or less than 175 pounds, you'll burn more or fewer calories respectively. 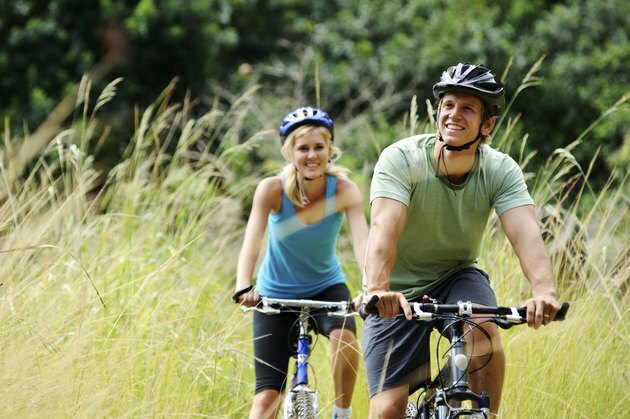 If you bike or walk uphill at a certain pace, you'll burn more calories than if you travel downhill or on flat ground. Results will also vary depending on your own physiology.